Fantastick Patrick is a international performer that specializes in variety entertainment. What is Variety entertainment you ask? Well, in Patrick’s case, it is unique entertainment that combines situational improvised comedy with a backdrop of absurd tricks and daring stunts that give life to a truly unparalleled experience. The show is perfect for any organization, corporation, or private event that wants to wow their guests with something truly incomparable to anything witnessed before. Each show is entirely unique because he uses audience interaction to guide the direction of the performance as opposed to using to same jokes over and over. Thus making for a show that is special to your event. Patrick has devoted his life to entertainment and loves giving you everything he’s got. 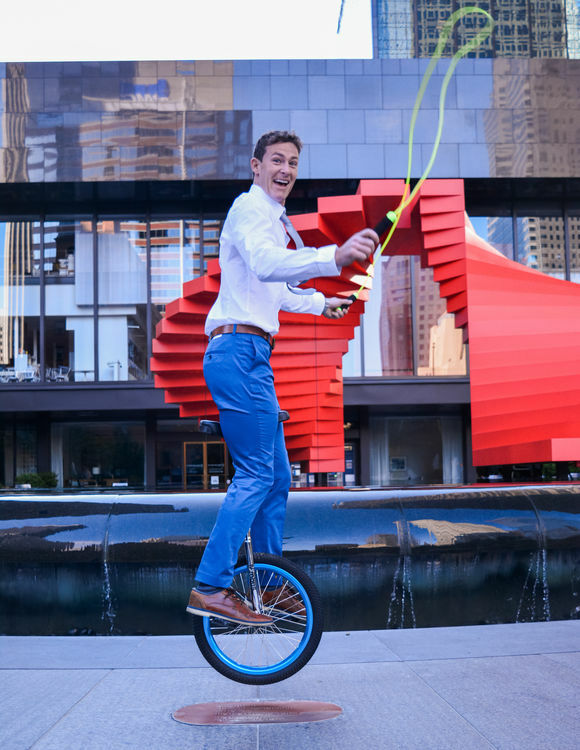 From a ten foot unicycle, to improvised songs on the ukulele, balancing step ladders, and swallowing balloons, we never know what’s going to happen at a Fantastick Patrick show but you can trust that it’s going to be amazing."